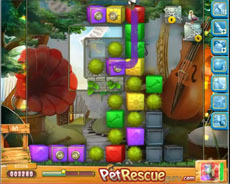 Pet rescue 535 is simple to be completed if you follow the specific strategy shown in the next video. Your first task is to release the key. To do it you have to smash the wires of the blocks around it. Then probably the block under the key and right of it will be infected. So you have to clear the block between these two blocks (using a paint brush booster, that gets activated, or a hammer if you have one) and then these two infected blocks to release the key. But DON’T use it till you are able to see the bottom of the screen and there is no block under the column the pet there is. Then use the key and you’ll have the pet rescued.